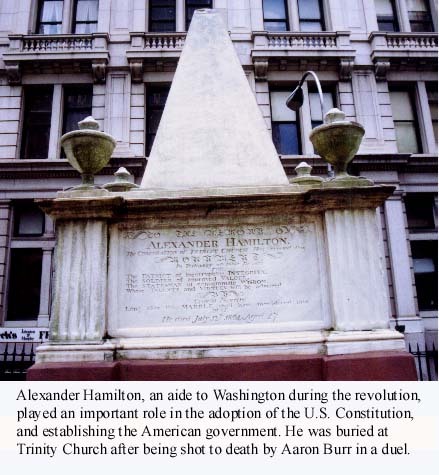 Trinity Church, which was burned during the Revolutionary War, saw the official end of the conflict and is the resting place of many martyrs of the revolution, including Alexander Hamilton. 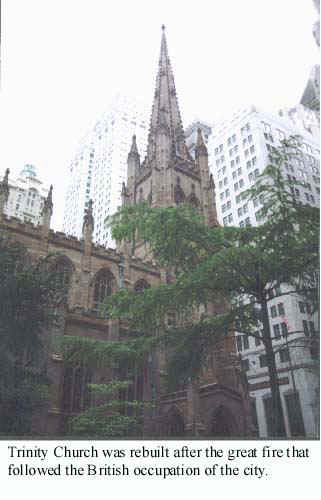 The church was chartered by King William III in 1697 and received a large grant of real estate west of Broadway. Much early patriotic activity in New York occurred near the church, especially in the Coffee House on Wall Street. Parisoners were leaving church as an express rider from Boston arrived to tell that war had broken out with the battles of Lexington and Concord. 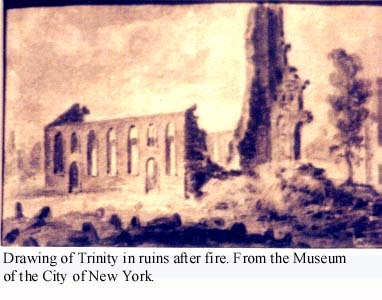 Trinity burned in the fire of 1776. The British seized the non-Anglican churches in the city and used them as prisons and barracks. That doesn't mean they paid particular respect to the ruins of Trinity. They fenced off the churchyard and hung lanterns in the trees, using it as something of a pleasure garden. 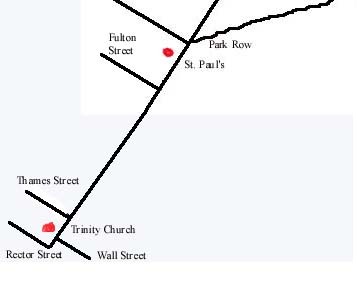 The burning of Trinity left St. Paul's chapel further north as the center of religious life in the city during the remainder of the war, and as New York served as the capital of the new nation. Hamilton was a brilliant aide to Washington during the war. He came to prominence in the new Republic as the youngest of the 55 framers of the U.S. Constitution. He was the first secretary of the Treasury and founded the country's first central bank. Hamilton was mortally wounded in a duel with Vice President Aaron Burr. In the church yard, in addition to Hamilton's grave, there is a memorial to the unknown martyrs of the revolution buried on the grounds. There is another Society of the Cincinnati memorial for the 16 officers of the Continental Army and Navy buried in the cemeteries maintained by the church. There is also a memorial to the thousands of Americans who died in prison ships in New York harbor. When the British evacuated the city on Nov. 25, 1783, the Americans marched into New York and stood at parade rest on Broadway near Trinity Church as a salute of 13 guns was fired marking the end of the war. Address: Broadway at Wall Street. Hours: Monday-Friday, 9 a.m. -11:45 and 1 p.m. to 3:45 p.m.; Saturday, 10 a.m. -3:45 p.m.; Sunday, 1 p.m. - 3:45 p.m.